Event fees include convenient airport shuttle on St. Croix (if you travel on the official start/end dates*) seven nights in a double-occupancy resort room, a bountiful buffet breakfast the first morning, catered dinners each night and all workshops (when offered), poolside concerts and evening dances. Participants are responsible for arranging their own transportation to and from the island. 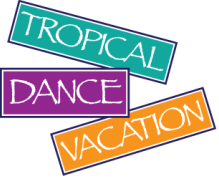 Once you sign up for Tropical Dance Vacation, you'll be sent tips on what to bring and what to expect of island culture, weather, etc. If we hear of airfare sales prior to the event, we will alert you. Frequent fliers might wish to use bonus miles. You can also check fares/schedules on these or other popular online travel sites. A $200 deposit per person is required. This is fully refundable until November 15, 2018. $100 is non-refundable after November 15, 2018. Full fee is non-refundable after December 15, 2018. You may wish to obtain Trip Cancellation Insurance to protect your investment. Dancers may still sign up after December 15, if space permits. Full fee is due upon sign up.